Things have changed so much for T and I in the past few months. Buying a home and getting a dog have been such an adventure, but we now spend our weekends completely differently. We made three trips to the hardware store and two trips to the pet store. Something that would have never happened just a few months ago. 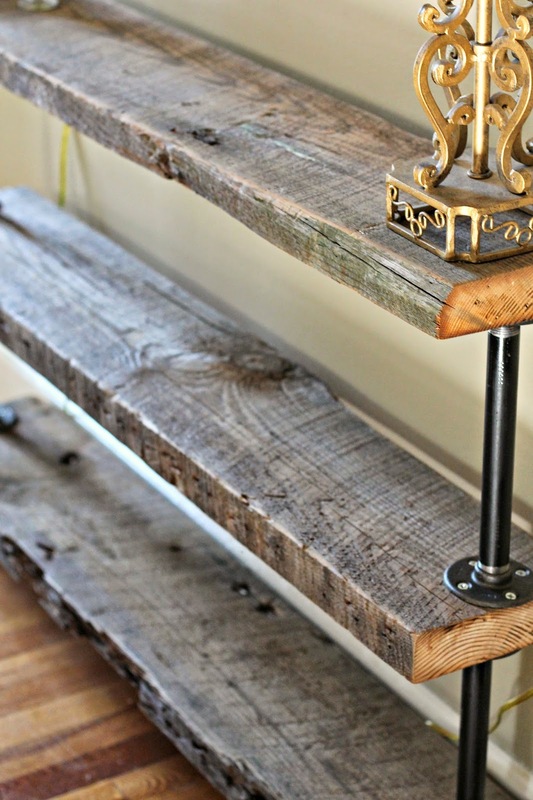 One project that I've been eager to get started on was the console table for our den. The wall you see as soon as you walk through the front door has been bare since we moved in, and it was really starting to bother me. We didn't have it in our budget to get the Restoration Hardware console table that I'd been eying, so we decided to build one of our own. 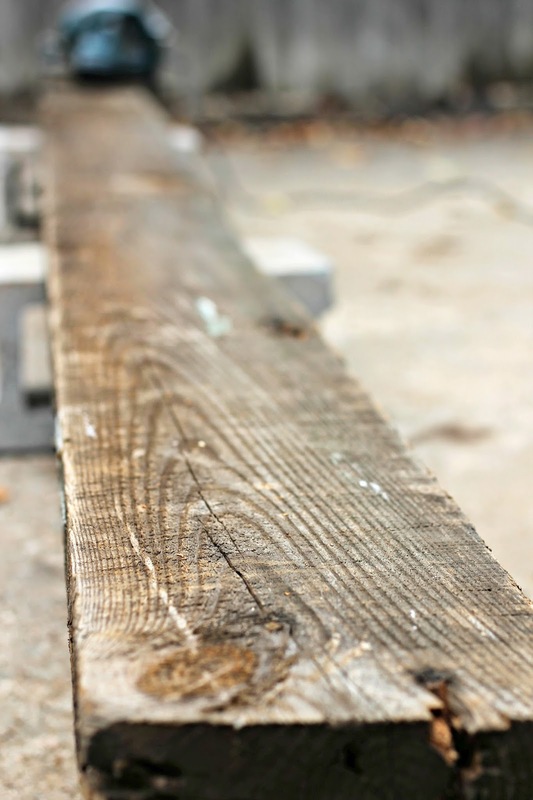 A few weeks ago, we picked up a large beam from a salvage yard. The beam was $5 and came off of a house built in the late 1800's. This weekend we went to home depot and picked up some black pipe, flanges, and end caps for the pipe. Making this table was quite simple. 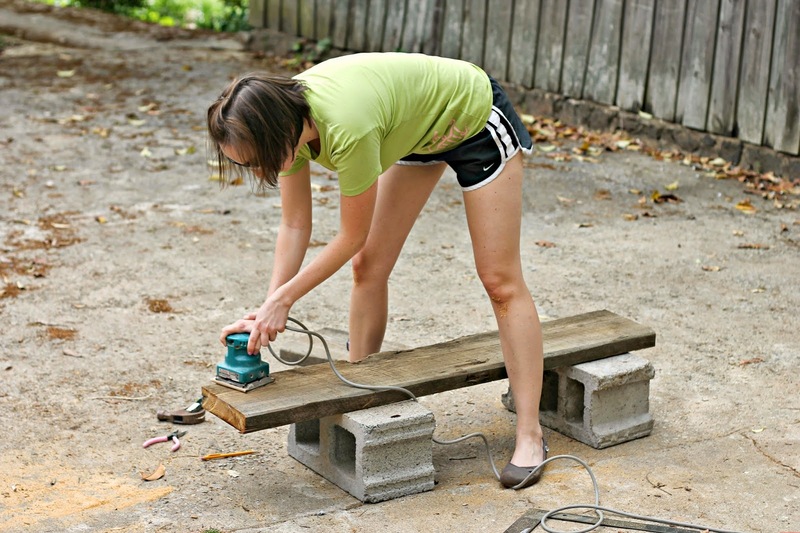 T helped me with the sawing part because power tools make me nervous, but everything else was very easy. The black pipe came from Home Depot, where they cut it down for us and threaded each piece for us. We wanted the table to be 30" high, so they cut four 10" pieces. We also picked up four 3" pieces of black pipe that came pre-cut and pre-threaded. Then we cut the beam into thirds and sanded each piece down. There were a few paint flecks that I wanted to preserve on the wood, so I just sanded around those. The table has four feet on the bottom, so we started by drilling in 4 flanges on the bottom piece. Then each 3" piece of pipe was screwed in and an end cap was screwed onto that to make the feet. From there, we screwed flanges on to the opposite side of that wood, one on each side, centered in the piece of wood. Then screwed the pipe in, screwed another flange on top of the pipe, and secured that to the next piece of wood with screws. We then repeated that step for the second shelf. I'm still working on getting some accoutrements together for the table, but that's the fun part. I've got to get something on the sides to hide those lamp wires soon, because they're really bothering me. If you're interested in making a similar table, I've broken down the materials and instructions for you below. Its much easier for me to view things in list form, rather than having to scroll through the entire post. Saw the piece of wood in thirds, leaving you with 3 4' long pieces of wood. Go over the wood with an electric sander, using the 120 grit sandpaper. Choose which piece will be your bottom piece of wood, and screw 4 flanges into the wood, one in each corner. Screw each 3" piece of pipe into the flange, and then screw and end cap onto each 3" piece of pipe. Flip the wood over, and let it sit on its feet. (if its wobbly, you can adjust the end caps to make it level) Screw one flange into each side of the exposed wood, make sure the flange is centered on the wood and flush to each end. Screw the 10" pieces of pipe into each flange, and top with another flange on the end of each pipe. 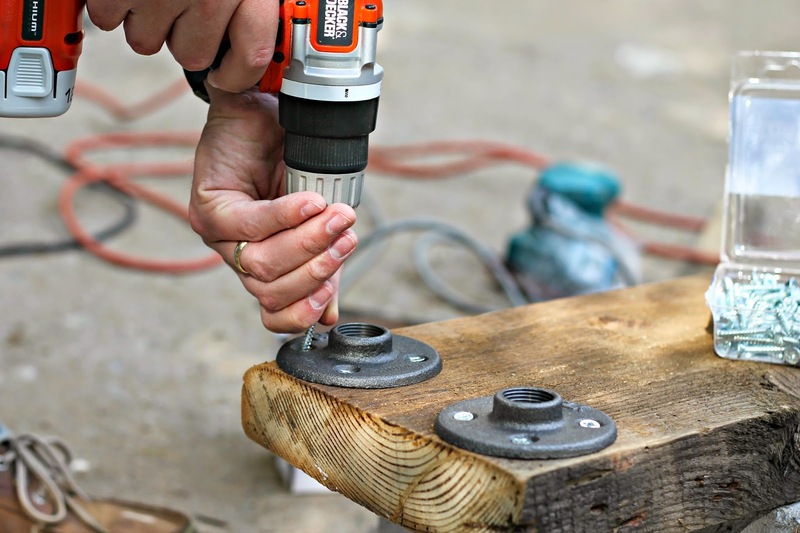 Set your 2nd piece of wood on top of the flanges, and secure them with screws. Repeat that step for the 3rd piece of wood as well. And that's it! This table turned out so well! It looks professionally made... y'all did a really good job with it! This looks awesome!! 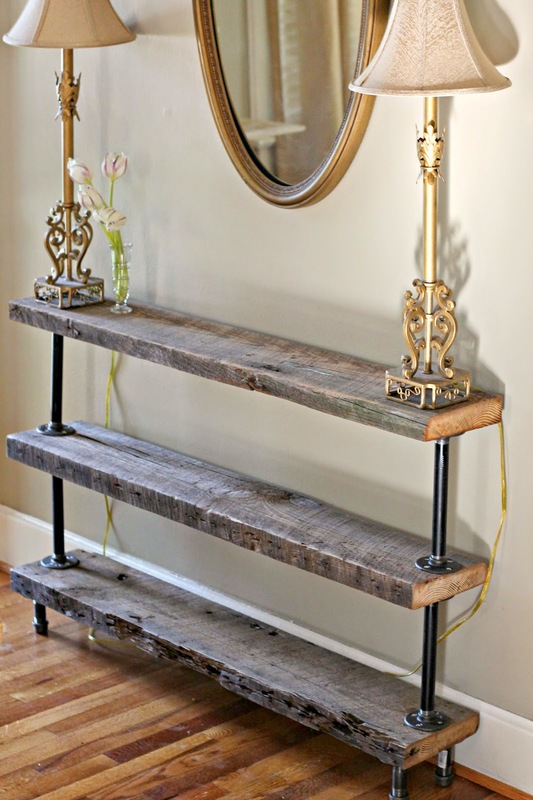 I want to create a new console table. Ours is so un-unique looking. I am so impressed! I thought the first picture was the one from Restoration Hardware, so when I scrolled down and saw the other pics I was confused. Then I realized it was the one you guys made! So impressive, it looks great. I'm nosy- what was the total cost and time it took to make? What an awesome table!! Thanks for sharing. Seriously, it looks so good! I actually like it better than the Restoration one- and I've been wanting a similar sized (height and depth) table for one of our walls. Great inspiration! This looks awesome!! I'm so impressed with you guys. I don't think I could ever do something like this! You did a great job! What a cool piece. I live in the Upstate too - excited to have found your blog!! This table is so neat - very impressed! !